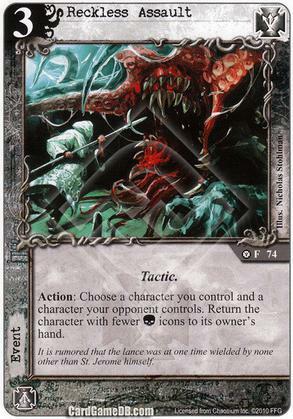 Flavor Text: It is rumored that the lance was at one time wielded by none other than St. Jerome himself. Can someone help me out with this card? Every time I come across it, I feel like there's something I'm missing. Any event that costs 3 had better be really good, yet this one seems like it should cost 1. Has anyone made good use of this card because I must be just missing it? It's not good, and as such doesn't get played that I have seen. Glossing over it every single time I parse my collection, but no, can't think of anything either. Lodge has better bouncing effects (with attached bodies for instance) at the same cost. If it was a Disrupt, I could see something, but not like this. The Tactic tag isn't really all that interesting either. What are you going to do, recur it with Naomi? Why not play Pushed into the Beyond and recur that one with Stanford, who's a legit addition to any Lodge deck anyway.